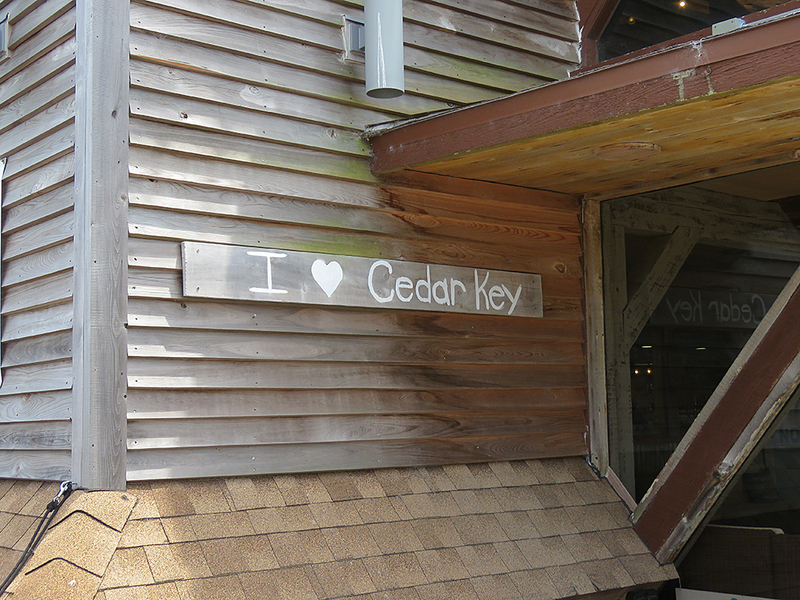 I had a quick visit out to Cedar Key last weekend, along with Mrs. Lonely Birder and some of her family. As they are not known to be early birds, I took the opportunity for some solo adventuring out to the wildlife management areas near Cedar Key [map] at dawn. The map is a little confusing, because the signage around the park said I was in the Lower Suwannee River National Wildlife Refuge but the Suwannee River is almost 10 kilometers (6 miles) northwest of where I was. If any readers have an insight into the parks situation at my location, please enlighten me! These few hours of solitude were just what I needed after the trying events of the past couple of months. The extensive mud flats here, with many shellfish exposed in beds that might attract plenty of shorebirds, under the right conditions. I started out by walking around and onto Shell Mound, an ancient pile of shells left by generations of the area natives, from neolithic times to the early European colonization/imperialistic era. The woods more mostly quiet, but for the calls of some White-eyed Vireos, some Clapper Rails in the adjacent salt marsh, and some Carolina Chickadees. Walking atop Shell Mound and it’s millions and millions of crushed shells. 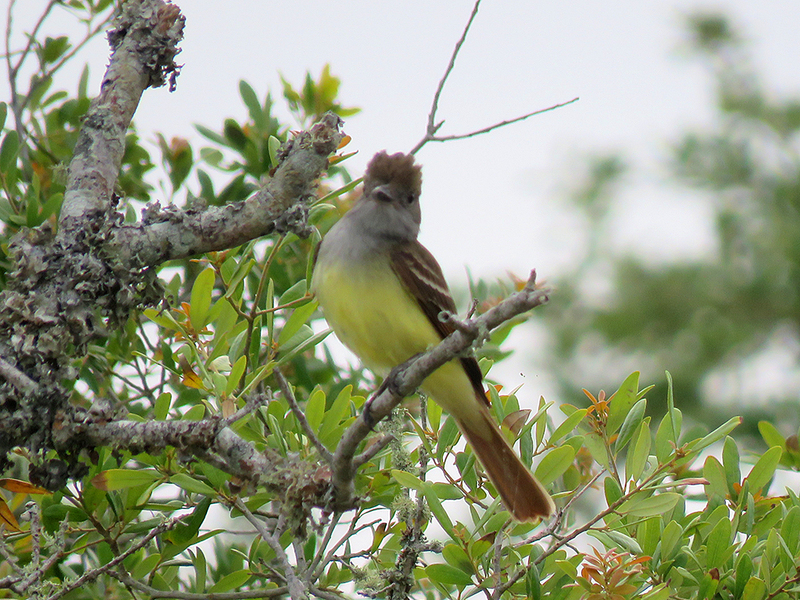 Near the boat ramp and fishing pier/observation deck, a pair of Great Crested Flycatchers were making a ruckus watching me as much as I was watching them! A mildly agitated and intensely curious Great Crested Flycatcher. There was a scattering of few shorebirds on the mudflats, but otherwise the more numerous flying things were the thousands of mosquitoes and midges swarming around me. The bug repellent held its own, though, and I only suffered a few bites before making for the shelter of Shell Mound and back to the car. 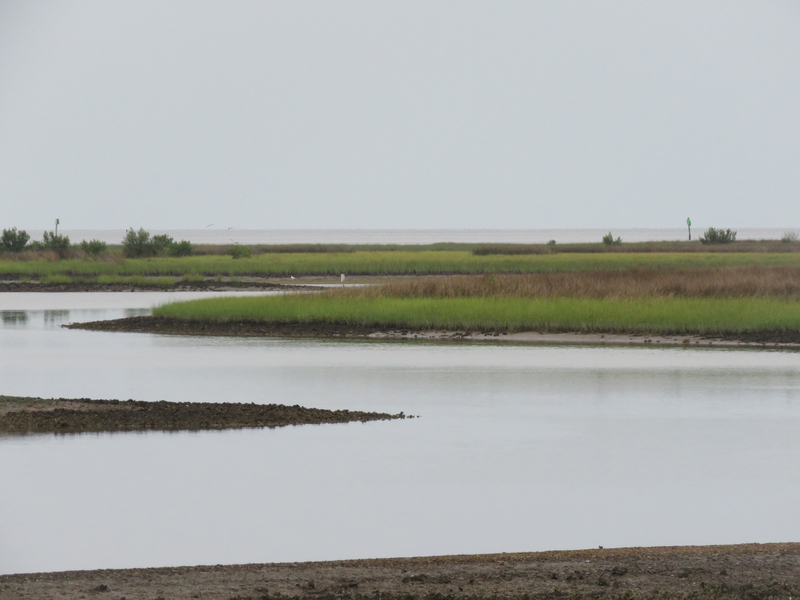 I then stopped at the Cedar Key Scrub State Reserve and walked a short distance, listening to and watching the Eastern Towhees, Common Yellowthroats, and White-eyed Vireos. I had a nice fly-over of a Wood Duck pair, as well as some “mystery” bird calls I never really deciphered. I picked up Mrs. Lonely Birder and the Lonely-In-Laws back at our motel and we made our way to Cedar Key “proper” for a nice afternoon of walking, shopping, and art galleries. Cedar Key is pretty and the tourist traps are a lot less “in your face” compared to many of Florida’s beach towns or keys. 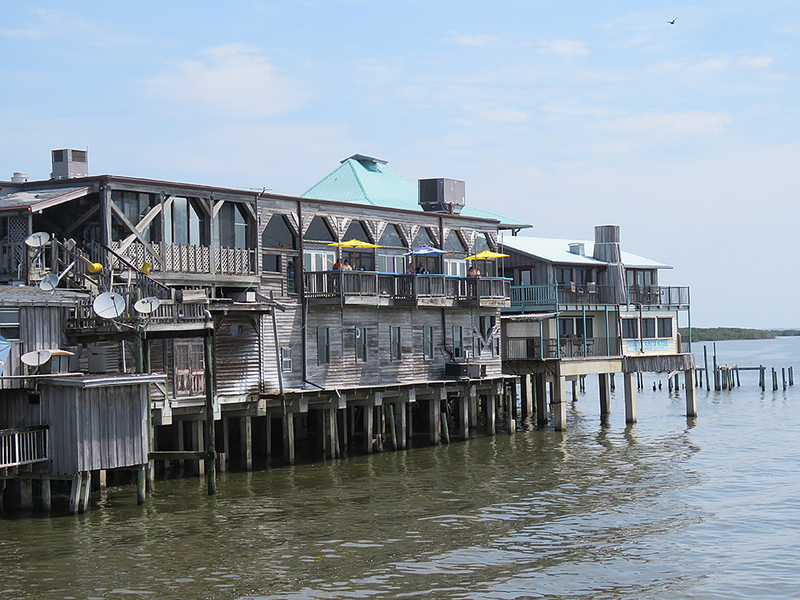 You won’t find many beaches on the main part of Cedar Key, but it’s a very pretty place. Even though we didn’t venture out into the more “natural” areas, there were birds tucked around here and there, particularly off shore where there were some people fishing and kayaking. But even along the more built-up parts had visitors. 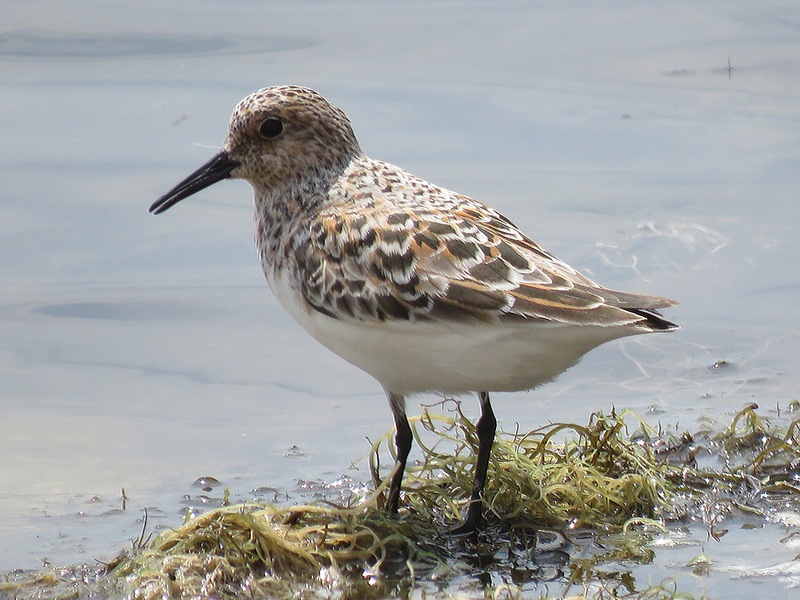 A Sanderling coming into breeding plumage. I almost never see these birds with this plumage, so at first I thought this was a Semipalmated Sandpiper. Thanks to the Brdbrain E-mail List community for setting me straight! 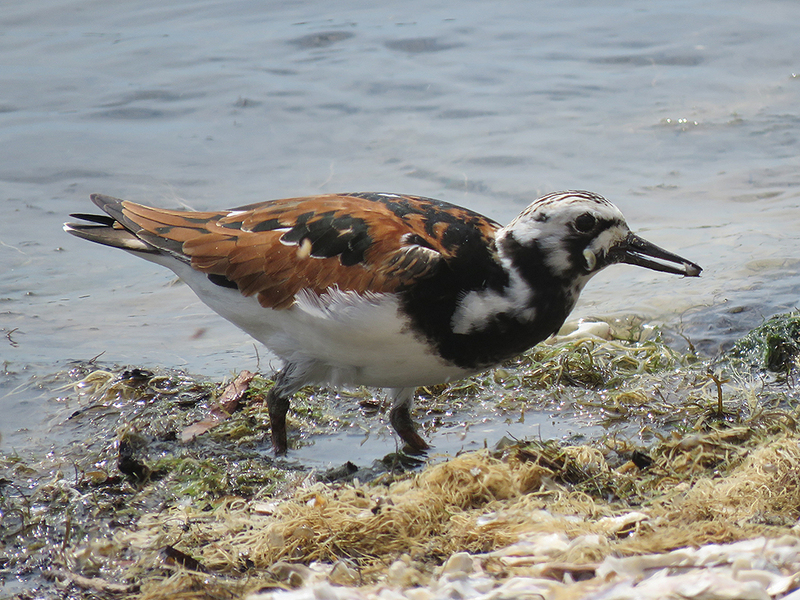 The above Sanderling was strongly associating with this Ruddy Turnstone (also in breeding plumage). There were eating small crustaceans near the Nature Coast Biological Station. A handful of Barn Swallows were swooping along through the area, but only one landed anywhere that I could see and paused long enough to get a good look (and a few photos). 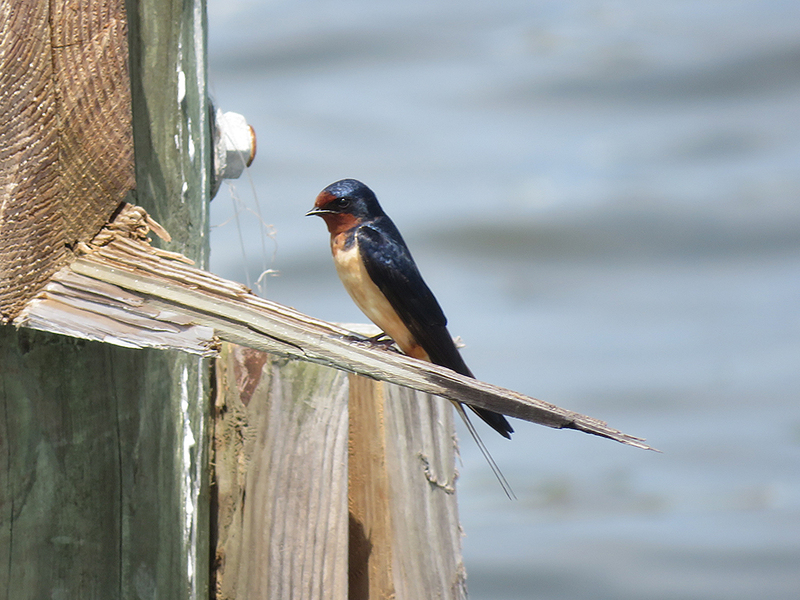 I’m not certain, but I think this is a young-adult Barn Swallow (just past fledgling), based on the “bib” on the throat. As with most of Florida, the usual resident water birds were there in large numbers. This handsome Brown Pelican (along with many of its friends) was patiently waiting for scraps from a man that was “preparing” some fish he had caught. 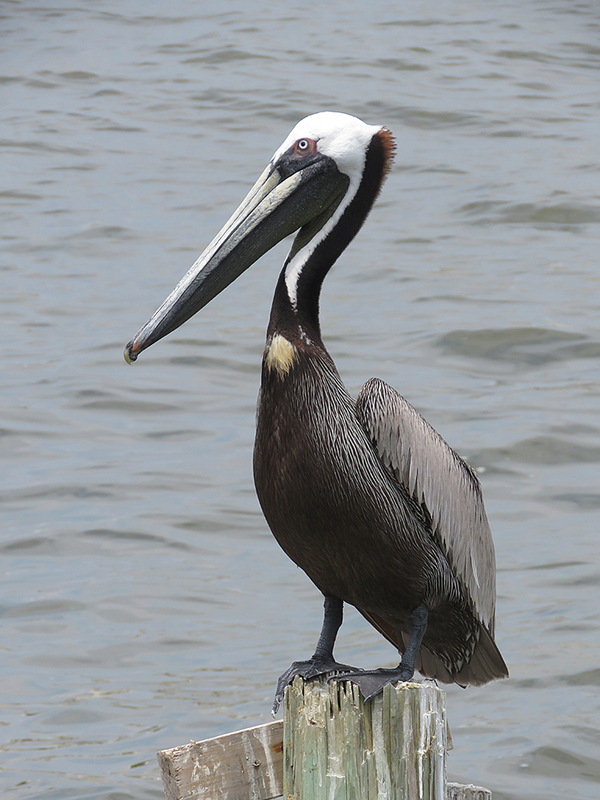 Adult Brown Pelicans are really quite striking birds, in my opinion. Also waiting for fish scraps were a bunch of Laughing Gulls. Almost all the adults now have their characteristic black hoods and white eye-arcs. This bird seemed to be having some trouble balancing on an old piling. 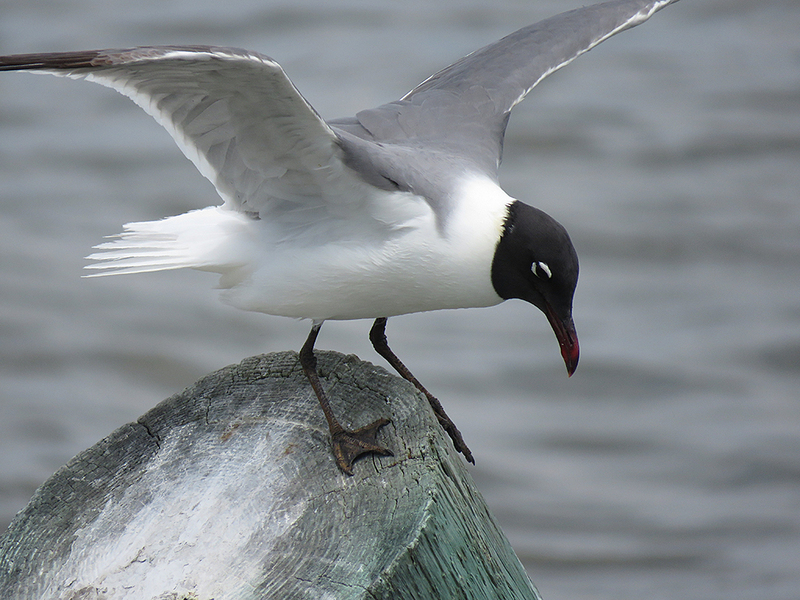 Laughing Gulls are handsome birds, even if they can be a nuisance at some beaches. Here at Cedar Key, I didn’t find them troublesome. After a nice lunch and a bit more shopping (mostly of the “window” variety), we headed back east toward home. For the curious reader, here are select eBird lists from the day. Definitely worth coming back for a longer stay! Perhaps next visit I will get out to the less developed keys and poke around, but for this past weekend, some strolling, shopping, and yes, birding, was just right.